It's the wrong rice, Gromit! I still astound myself sometimes. Yesterday for the Drama Teen’s party, I thought I’d make a dozen or so O-nigiri — those rice triangles the Japanese eat as sandwiches. Many of her friends study Japanese as she does and are similarly as obsessed with manga, anime, and all things Japanese. So I get out my Japanese rice. Wait a minute. Turns out I only have a bag of sweet rice. Why is that? Suddenly I’m confused. Isn’t this the same as sushi rice, which is also “sticky?” Why would I have a bag of this if it’s not the same thing? I read the back. It says it’s excellent for Japanese confections, which I’m not making today, but maybe one year, so maybe it is the same thing. It must be, I tell myself. So I go ahead and make a big pot of this, hoping for the best. For as disorganized and unskilled as I am in the kitchen, I do have a way with rice, for whatever reason. And Japanese rice, in particular, has to be made in a certain way or it won’t come out. Alas. This rice came out perfectly. But it was the wrong kind of rice for O-nigiri. Wayyyy too sticky to work with. FAIL! Now I’ve got a big old pot of sticky rice and no ideas what to do with it. Any ideas? Sounds like you have the makings for fried rice! If you like your extra chewy fry the heck out of it until the rice starts to pop. I’ve never been able to make perfect rice of ANY kind so I buy mine precooked now. The best pre-cooked sushi rice evah? Head on over to Bristol Farms sushi bar of course – and it’s the least expensive thing they have! A full bowl is a little over $2. What kind of parent are yo that you didn’t know you were serving the wrong rice. You should be beat within an inch of your life. Actually, the little or should I say medium sized bogger pickers should be thankful are are even thinking about feeding them. Make fried rice or Natalia’s fave, sticky rice balls. She rolls them in cinnamon sugar. Use Saran wrap in the mold or to mold ur shapes by hand. I just use wet hands so it won’t stick. I’m sure her party was still a hit, it’s the thought that counts. 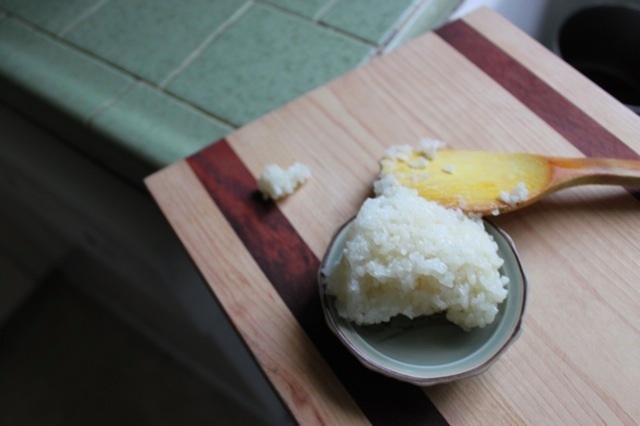 Who doesn’t love sticky rice!! You get major points towards that mother of the year award for even trying to make o-nigiri! This is how great new recipes start -you can even name the new dish after the birthday girl! sweet! No wrapping necessary!! You’re a good mom! Previous post: Maldon Smoked Sea Salt: Does that Make me a Foodie?